Chatbots are the newest ecommerce trend. Everyone is talking about them and every business wants to figure out how to use one. Just how “smart” are they? Should you invest in chatbots for your business? As much as we want to believe we live in a world full of intelligent automation the likes of Google Assistant and Amazon Alexa, there are limits to what today’s chatbots can actually offer. That said, chatbots are here to stay – and to make our lives as ecommerce marketers easier. Of course, that comes with a few caveats. Chatbots are tiny programs that help simulate interactions with customers automatically based on a set of predefined conditions, triggers, and/or events. They can be proactive or reactive. Their responses are consistent every time. They can respond to customers immediately. They can help you collect important data and also learn from the data collected. They can be used through a variety of different mediums like SMS, live chat, or even social media. The concept of a chatbot itself is nothing new. In fact, they’ve been around since the 1960s. In fact, if you want a crash course on the history of the chatbot, check out this infographic from Futurism. However, applying chatbots to help businesses grow is only a recent phenomenon. Applying chatbots to business use cases is the result of democratized technology in recent years. As customers become more demanding not just in the way they choose to buy, but also in the ways they wish to communicate with businesses, many traditional online experiences simply aren’t capable enough. Business applications of chatbots for consumer-facing goods are growing rapidly. In fact, over 59% of millennials and 60% of Gen Xers in the United States have interacted with chatbots. And according to a Facebook survey, more than 50% of customers say they’re more likely to shop with a business that they can connect with via chat. Customers expect to be able to find the information they’re looking for in a click of a button and in the blink of an eye. When this isn’t possible, frustration brews, and this can lead to you losing a sale or even losing a potential customer forever. To understand how chatbots can mitigate some of these frustrations and improve the user experience, we need to first look at how customers are choosing to interact with businesses today. 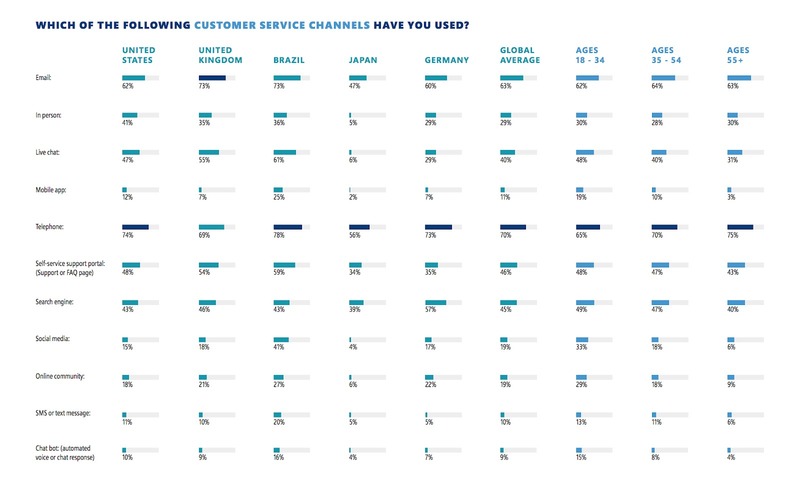 In the 2017 Global State of Customer Service Report by Microsoft, we can see how email and telephone are still the dominant communication channels for many customers. And while live chat, self-service, social media, and chatbots are relatively lower in terms of raw volume, the growth of these channels are staggering. The common themes among these four specific channels are speed and accessibility. Keep these in the back of your mind as we go. In a recent survey conducted by Audience, MyClever, and Drift in order to better understand where the opportunity lies for chatbots, they asked thousands of customers to evaluate their online experience with businesses and to detail their frustrations. Sites hard to navigate (34%). Basic details about a business hard to find (28%). Takes too long to find services (27%). Without some sort of live interaction with customers, traditional online experiences are falling short. Consumers have a high expectation from businesses when it comes to the speed and accuracy in which they can obtain answers to common questions. There’s a clear match between what chatbots can offer businesses and how they can help alleviate the top 4 most common frustrations. It’s important to understand that while chatbots are helpful in many ways, customers still vary in all shapes and sizes. Before diving head first into adopting a chatbot for your business, you should first understand why individuals might want to converse with chatbots rather than a real human being. Crafting a chatbot user interface will vary based on your industry, business, and target audience. Get a quick answer to questions. Get a resolution to a complaint or problem. Get a more detailed answer to a question. Find the best way to communicate with your business. Instead, when people think of chatbots, they most often think of their use in customer service across channels. Advances in AI: smart AI capabilities mean chatbots can help predict what customers will need or want to buy based on past purchase history and additional machine learning capabilities. These bots can then begin to take a proactive approach other than a reactive upselling approach outside of email. Chat apps are one of the most popular on the web: And multiple social media channels (the other most popular apps) are integrating chat functionality in to their platforms – along with chatbot capabilities. This gives businesses a new way to get in front of their customers where their customers already are. Little to no development costs: There are tons of apps and tools out there you can use to launch a chatbot strategy and begin testing its effectiveness. There is no huge up-front cost – just conversation mapping work you need to do on your end. Growing conversation APIs: These APIs allow machines to speak to human using natural language processing – which means you don’t feel like you are talking to a chatbot, though most folks know they are. That matters. The business decision to implement chatbots doesn’t only have to be about offering customers a better experience in terms of customer service. Remember, the central theme is about customer experiences. And more often than not, a better experience will mean more revenue later down the road. Because chatbots can help with the 4 most common frustrations such as getting simple things answered quickly or getting some basic information about a business, chatbots can easily perform basic frontline support tasks. For example, when a customer asks a common shipping question, a chatbot can easily understand the context and provide an FAQ article explaining your shipping policies. If a customer wants to know how they can place an international order, a chatbot is uniquely suited to provide a quick answer to that. And even if a customer is asking how they can talk to a human, the chatbot can easily escalate the request to your support team. These types of conversational marketing techniques can take a significant amount of time for your staff to answer even though the answers are fairly standardized. By allowing a simple conversational bot to take over these frontline questions and concerns, you can significantly reduce the number of resources needed to satisfy customers. Chatbots can help your business acquire customers more easily than live human agents. This is because modern chatbots use natural language processing and direct messages to converse with customers. Automating the initial engagement with site browsers (new or returning) or app users without a live human agent is highly scalable and can help qualify interested users easily. Chatbots can also be used to automatically lead potential customers to find what they’re looking for – like related products, certain collections, etc. Drift’s sales enablement chatbot does this extremely well and automates the gathering of important information from customers so the sales team can follow up. The application for this is valid for all industries and can give you a measurable advantage compared to competitors who’re still doing this manually (and most likely missing out on new opportunities). The sad truth is, no matter how many content guides and tutorials you write, customers still don’t always know where to go to find the information they’re interested in. It’s also not uncommon for customers to be reminded of what they’re looking for after a conversation has been started. This is where chatbots can provide a lot of assistance. Because chatbots are built to ask questions, collect answers, and automatically direct customers, window shoppers, and new customers can get a lot of value out of simply being asked what it is they’re looking for. By asking a series of qualifying questions, you route users to the best place for them to find the information they want. Hi! My name is Hello Bot, can I help you with something? Which products are you interested in? We offer A, B, and C.
Do you need help with this product? I have an article here that can provide you with more details. Would you like to read it? What is the preferred time you wish us to call you? What is your contact information so I can pass this along to our sales team? Your chatbot implementation can also intelligently parse what a customer has or hasn’t completed in order to nudge them along the conversion funnel. It looks like you haven’t uploaded a logo yet. Would you like me to show you where you can do that? Your account is about to expire soon. Can I show you the plans we offer? It sounds like you’re having issues with X. Would you like to speak to one of our customer success managers? By personalizing the questions a chatbot asks, you can direct customers to the best way to buy and create a better user experience along the way. An important rule to remember when going down the chatbot route for your business is that chatbots are actually industry-specific and there currently isn’t a one-size fits all bot. For example, ecommerce companies will likely want a chatbot that can display products, handle shipping questions, but a healthcare chatbot would look very different. Also, while most chatbot software is continually upping the AI-ante, a company called Landbot is taking a different approach, stripping away the complexity to help create better customer conversations. And while chatbots are great for batting away common problems, it can go very wrong and become a liability for your business without an escalation path to a real human. Chatbots are not currently ready for handling everything. This must be considered when you decide to bring in chatbots as part of your customer service or marketing mix. Chatbots in their simplest form can be thought of as a newer form of PBX (press 1 for …, press 2 for…) and this can actually help resolve a lot of issues. Conversational Bots in the most complex form are neural networks meshed with deep learning. This cutting-edge type of chatbot may not necessarily be what every business needs. Sometimes the simpler “menu bots” can get to the root of the problem and might come at a cheaper cost and address the most prevalent issues. Chatbots should be about simplicity. Chatbots and Natural Language Processing (NLP) are getting pretty strong and smart, but can be quite an investment if you want it to mimic a smart customer support employee that does not annoy customers. Building simple chatbots are good for handling simple requests and helping customers get started. But as the filtered customer support requests come in and you see the new trends in conversations, you need to invest additional resources to refine preexisting chatbots or create new ones to handle different tasks. Transitioning into (and also out of) Chatbots. It’s important to set expectations with customers if a chatbot is currently part of your customer service and marketing experience. While some brands may prefer 100% digital experiences, others still need a human element in order to close a sale. Problems may still arise even if your chatbot works spectacularly but fails at understanding its limits and ultimately fails at guiding shoppers through the right experience. When a particular chatbot hits a dead end and can no longer help the customer, and only then do you reveal that it’s actually a bot, the experience can be negatively perceived. But when proper expectations are set, customers typically are not put off by a chatbot’s limited understanding or capability, and their impression of the interaction remains positive. Businesses wanting to use chatbots need to make absolutely sure that a smooth handover protocol is in place to transition customers to a human agent. The sensitivity of this protocol needs to be predefined so customers aren’t met with overzealous chatbots. In many ways, website chatbots are some of the most popular types of chatbots around. Because so many businesses now leverage the convenience and speed of on-site live chat to help customers, adding a chatbot to enhance that personalized experience is often a no-brainer. Chatbots are great not only for customer service but especially for eCommerce. The most common use case for chatbots is simply engagement. On the business side, however, having a website chatbot will also mean you’ll have somewhat less access to full automation than with social media chatbots (which we’ll discuss later). This is because a majority of website chatbot conversations should eventually lead to a human contact. Even if the chatbot is able to solve simple problems for customers or schedule appointments, it’s crucial that a human agent gets in touch with the customer as soon as possible. Implementing a website chatbot is about flexibility than semi-full automated engagement. Chatbots typically live within the designated “live chat” experience, therefore customers still expect the ability to reach a human agent when they are ready. Some of the best examples of website chatbots are found at Drift. Drift is a thought leader in the field of conversational marketing. Drift’s chatbots can help engage new prospects and reduce the friction commonly seen during the sales process. Drift chatbots can also seamlessly connect a sales team’s efforts to converse with a customer through automated triggers! Drift chatbots can even help route important conversations to the right staff using advanced routing rules. You can try Drift chatbots by signing up for an account with Drift. Re:amaze, a helpdesk and customer messaging platform, is also working on a revolutionary new way for eCommerce businesses to introduce chatbots to their storefronts’ live chat experience using microbots. Microbots are limited in scope but very good at specific tasks. Some microbots can be helpers for getting order info, getting shipping info, getting product reviews and other conversational commerce topics; while other microbots specialize in suggesting FAQ articles based on customer queries. These microbots can be deployed by store owners in sequence and in context, offering customized and automated conversations that happen in phases. Re:amaze FAQ chatbots are currently in Beta and is available for BigCommerce customers to test drive today. Facebook’s chatbot platform through Messenger is another crucial piece of technology to follow. If your brand isn’t already on Facebook, you’re seriously missing out. Facebook Messenger chatbots not only provide automated messaging to help answer or provide information, it also serves as the central hub for a lot of social media based marketing for some of the largest brands in the industry. Give you the ability to send and receive text, images and rich bubbles with CTAs. Send Messenger greetings and call to actions to prompt users to “Get Started”. Create Messenger templates that let customer tap buttons and use other visuals to interact with your bot. And, as more conversational bots continue to be developed, more businesses are sure to see an increase in sales and productivity. With more than 1.2 billion active monthly users on Facebook Messenger, businesses who are on Facebook can immediately see the value of adding a chatbot to its Messenger presence. However, diving into Facebook Messenger chatbots requires you to have a good understand of your existing customer base. 1. Do your customers already engage with you on Messenger? If not, implementing a Facebook Messenger chatbot might not have much effect as it is centered around engagement on the Messenger platform. Or, if your marketing team plans to make Facebook Messenger a more pivotal part of your efforts, then a chatbot might be worthy of the investment. 2. Will implementing a chatbot for your Facebook Page serve a particular purpose? Keep in mind chatbots are supposed to enhance your customers’ experience, do you already have a use case in mind? Maybe it’s designed tell them about new products? Or to assist them in checking out? The value it provides your customers should dictate how you design and implement a Facebook Messenger chatbot. If you anticipate most interactions with the chatbot will happen on mobile, do you have a mobile presence good enough to augment what the chatbot can offer? These are important questions to ask before investing in a chatbot. 3. Are you equipped to support customers when the chatbot can no longer interface with customers adequately? Your team will need to work with your Facebook Messenger chatbot to round off the customer experience. Are you using a 3rd party like ManyChat to design and deploy the chatbot? If so, do you have the necessary resources to maintain and keep the chatbot up to date? ManyChat is one of the most popular bot builder platforms for Facebook Messenger. You can check out some of their case studies on their website. Social media chatbots are some of the fastest growing bots in the marketplace. When you add chatbots from platforms like Twitter or Facebook to your marketing strategies, it’s important to focus on implementing them in a way that not only adds value and improves the user experience but also lead customers to a rewarding purchasing experience. Twitter’s access to real time data, customer insights, traffic patterns, and powerful private messaging platform makes it an ideal candidate for chatbot interactions. Increase engagement with their customers. Take their brand to the next level. With advanced API access for developers, Twitter chatbots can become a critical part of your brand’s customer service and sales strategy. Automation is controlled by a set of rules that builders must follow in order to successfully broadcast helpful information, generate engagement through creative content, and automatically reply to users via direct messages. “Twitter averaged 330 million monthly active users in Q4. Analysts had anticipated 2 million MAU net adds in the period. In Q4 2016, Twitter gained an average 1 million monthly users. During Q4, Twitter live-streamed around 1,140 events, with 60% of those reaching a global audience. These metrics have far reaching implications if you’re looking for a chatbot platform that goes beyond just customer service. In addition, Twitter recently announced a new enterprise-focused API to improve upon the chatbot experience so that developers can build more “conclusive and engaging experiences via chatbots”. According to TechCrunch, the new API is designed “to help developers build apps that can power customer service, chatbots and brand engagement on Twitter”. One thing that separates Twitter apart from Facebook is the fact that Facebook (and web chat) bots tend to support rich formatting (carousels, images, descriptions, etc) that make it good for commerce applications. However, Twitter does not currently support this. This means Twitter chatbots tend to be more NLP based. Therefore, the applications are less driven by things like Quick Replies and decision trees and more by Neural Network driven bots. There’s more experimentation in this area but it might not be as suitable for an eCommerce store trying to get a chatbot running for sales purposes. See how you can build your own Twitter chatbot using Sprout Social. Chatbots are still considered an emerging technology, but they are quickly maturing and becoming a staple in many businesses’ customer service, sales, and marketing operations. That said, a lot of current generation chatbots are still in their infancy – they have big ambitions but lack the experience and expertise needed to truly deliver. The path to greatness is not a forgiving one. As artificial intelligence, machine learning, and deep neural network application matures, each new generation of chatbots is bound to be better and better. During this transitional phase, it’s important for business owners to understand that poorly executed chatbot protocols can still fall short and offer a poor customer experience. Brands should focus on implementing chatbots in a way that simplifies existing processes rather than going for the fanciest promises. Offer guidance to customers, set expectations, and teach customers to interact with chatbots in a way that is ultimately beneficial to the growth of your brand.